Here is a cool highlight video from our friend, Bamadog, on on Youtube. Some folks say that the win at Ole Miss was a "ho-hum" win, but when you look back at it, there was actaully some nice highlight reel plays in this game. Lets get excited about this Crimson Tide team... a win is a win is a win... especially in the SEC. My favorite highlight was the Trent Richardson 85 yard catch and run for a TD that comes about 2:45 into the video. Now that was sweeeeeeeeeeeeeet! I am hoping Bama obliterates Tennessee this year. We could use a few highlight reel runs by Trent, Maze (and Julio if healthy), and Ingram in this upcoming Tennessee game. The offense has been struggling a bit, but look for Alabama's offense to break out this week! 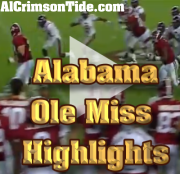 Meanwhile, sit back and enjoy this "Nightrain" video (Gun's & Roses) that perfectly illustrates the highlights of Alabama beating Mississippi 23-10 for a spectacular homecoming game at the Capstone! I am going to add a list of Alabama football tickets for sale below. Check it out too if you are interested in catching an Alabama game in person this year! This was enjoyable to watch! It makes me anxious to see Mark Barron put Cam Newton in his rightful place!